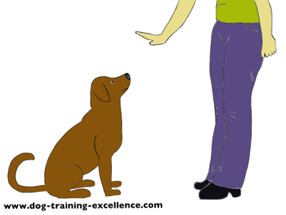 Train your dog to come when called with patience, perseverance and a fun attitude. A dog recall exercise must be a game, if your dog enjoys getting near you when you call his name, he won’t hesitate to come, even in challenging situations. You must actively teach your dog this particular skill and practice it until it’s perfect before you can expect your pooch to respond in a “real life” situation. A dog that won’t come when called is probably afraid to be punished, and this dog may not be wrong. Most of the time we call our dog to come to end a play time session, to stop a fun squirrel or bird chase or to go home. See the pattern? Most dog parents punish their dogs (without realizing it, of course) for coming when called. So, a puppy grows to learn NOT to come. 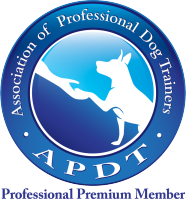 Follow the step-by-step dog recall program for successful training. To train your dog to come, you will need dog treats of different value. Use "boring" treats for easier situations and "exciting" treats for challenging activities. Teach your hound a Marker Word (Good Dog!, Great!,or any other you like) by saying it and immediately afterwards giving him a treat. Use this word to MARK a good response or behavior and always follow it with a treat. 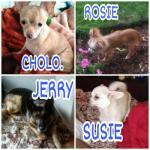 Teaching your canine friend his Name and the command Sit are also useful for a reliable recall. During training use a leash or secure area to prevent your dog from running away or crossing streets. Always reward your dog when he comes to you, no matter how long he took. The best leash to walk your dog is a common 6-ft one, nothing fancy, no-retractable leashes. If you are going to be practicing outdoors, I recommend you get a 20 ft leash (like the one below) to add distance to the training in a safe manner. Always have your dog wear a collar with a name tag. A great challenge to this program is to practice at night, use a glow-in-the-dark collar to know where your pooch is at all times! You will repeat each step until your dog responds 8-10 times, out of 10 times you call him. Always start from Step 1 when changing locations or adding distractions. If you notice your dog is "not getting-it" step down a step or make it easier by reducing your distance, taking away distractions or using a better reward. From no more than 10 steps away, call your dog’s name followed by “Come”, crouch down, pat your hands on your lap or clap them and use a high pitched fun voice. As soon as your hound STARTS coming towards you, say the Marker Word. When he arrives near you give him a treat. From no more than 10 steps away, call your dog’s name followed by “Come” use a high pitched fun voice but start calling in a straight position. When your hound is only a few steps away from you say “Sit” (you may need to lure him in the beginning) and after he sits SAY your Marker Word and give him a treat. From now on you will ALWAYS ask your dog to sit before you reward him for a recall. Add distance, call your dog from further and further away. The last challenge in this exercise is to practice calling your dog when he can’t see you (Giving your back to your dog, from a different room, behind a tree, etc.). 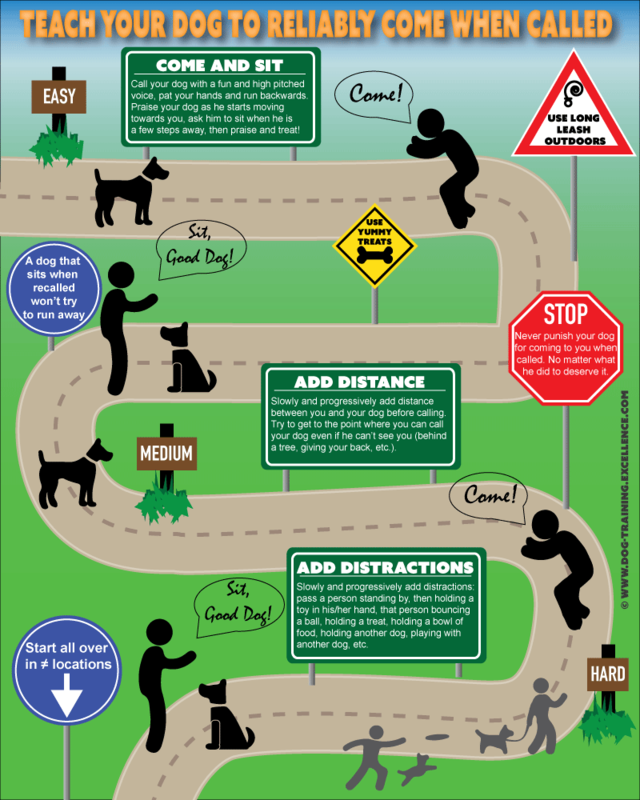 Add distractions, start with easy ones and only as your canine friend succeeds advance to more difficult ones. You can start with a person standing by, then that person with a toy in his/her hand, that person bouncing a ball, holding a treat, holding a bowl of food, holding another dog, playing with another dog, etc. Be creative and try to think of as many “real life” type situations as possible. For example, have a person pet your dog while you call him, then play with your dog, then feeding your dog. While your dog is sniffing another dog, playing with another dog, chasing another dog. If your pooch likes chasing little critters, then have a friend move a plush toy with a string on the floor while you call your hound. Practice is the key to condition your dog to come when called. Conditioning means your pooch will respond almost unconsciously to your command. Add different locations, start at your home in one room, move to other rooms, the backyard, front yard, garage. Call him from different rooms of the house, from upstairs, downstairs and any other combination your home allows. Take the training to the dog park! Bring a higher value treat with you this time and be prepared to be patient and always happy. The dog park is a great place to work on a dog recall without a leash but I recommend you start when the park is not so crowded. As your pooch gets better, progressively train him when the park is fuller. The exercises should always start easy and move up to difficult in different locations. For example, the first time at the dog park, make sure there are only a few dogs and that they are far away. Let your dog smell a tree or a patch of grass away from you and then call him. More articles to keep training your dog! Need more tips to work on your recalls? 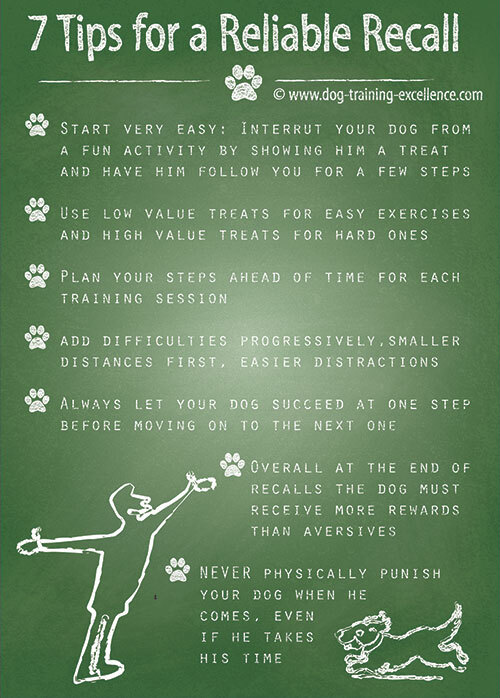 These 7 Professional Tips to a Reliable Recall will help you achieve the perfect "Come" with your dog! You can work on your STAYS while you practice recalls as well! 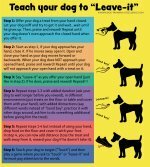 A great way to start giving challenging scenarios to your dog. 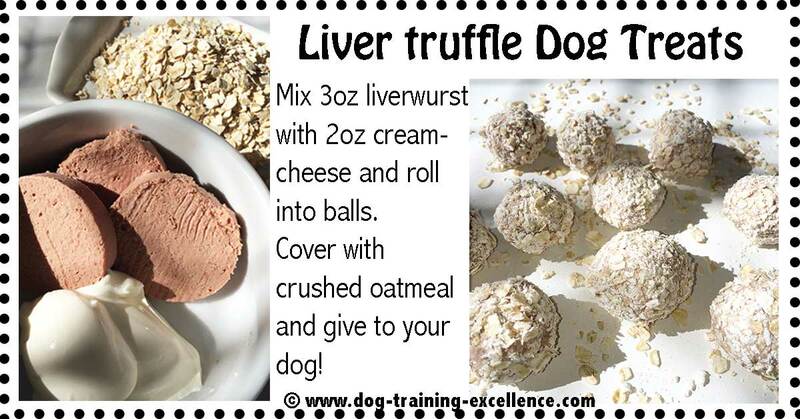 Need something yummy to motivate your dog! Try these home-made dog treats that are easy to make and irresistible to your pooch! Questions? Anecdotes? Tips? Leave me a comment in the box below.